A tantalizing body of water undulates before the viewer. Cayo Levantando III (2009-2010), Julio Valdez's recent oil and ink painting on linen, nearly five by eight feet, features rising and falling brushstrokes in shades of turquoise and aqua with green, white, yellow, and purple accents. The painting is formally alluring, drawing the viewer in with its play of light and space. Water flows across the canvas, changing directions; it doesn¿t follow a perceptible pattern and tension is evident, indicative of the water's force. Spectators cannot be sure whether they are positioned above the water or facing it straight on so that they can see its reflective surface. This sense of displacement expands the symbolism of the painting to more than a metaphor for the liquidity of the paint and the creative process. More than half a century later, the same can be said for the Dominican-born artist's New Water Paintings. Valdez has been painting the liminal symbol of water for a lustrum, exploring the spaces in between reality and surreality. Nearly all of the fifteen paintings on view at Latin American Masters in Santa Monica, California, prominently feature bodies of water, some containing silhouettes of human profiles, standing figures, outstretched bodies or aquatic animals and vegetation. Niño Soñando (2009), an oil and ink painting of water on rice paper on linen (57"x 61"), is painted with similar depth to Cayo Levantado III. However, a dark gray and shadow-like body of a child floats on its back beneath the surface of the water. The body, with the mouth slightly ajar, does not appear to be floating peacefully across the surface of the water; rather it appears as the ghost of a child. Perhaps it is an allusion to the artist's son who appears in other works, or a nostalgic, or even melancholic, reference to his own childhood spent near the sea. The blues and greens seen in the previously discussed works are replaced by deep reds, pinks, and purples in La Maldita Circunstancia (2007), acrylic and oil on three wood panels (96" x 114"), converting the sea into a blood-like substance. In the left-most panel the bust of a man, in the semblance of the artist, painted in shades of blue, bobs above the surface. Below him floats a small origami boat. The paper boat is a metaphor for both childhood and yolas (makeshift boats or rafts used by Dominicans to leave the island). This image depicts both nostalgia for the island life and its darker side. The weight of insularity, or the island condition, is further referenced in the title which is derived from the opening line to "La Isla en Peso" by Cuban poet Virgilio Piñera. 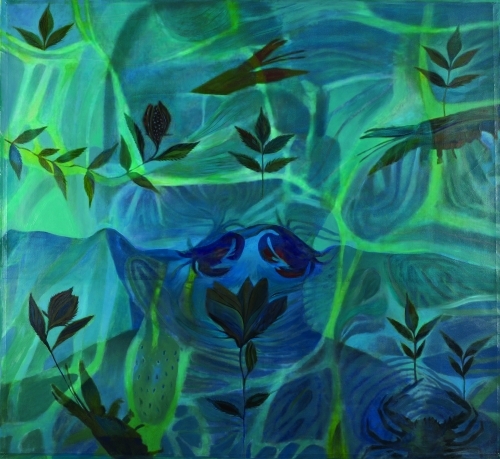 Pido Silencio, 2009, oil and ink on canvas on wood panel (29" x 83"), includes a dark silhouetted figure lying horizontally on the bottom of the panel, submerged in a body of water. Is this silhouetted figure a self-portrait of the artist or a symbol for mankind more generally? Is the figure a shadow or figment of the viewer's imagination? Similar silhouettes have been discussed as the artist himself floating between the Dominican Republic and New York, illegal migrant workers lost in the Canal de la Mona between Quisqueya and Puerto Rico, and figures in the position slaves assumed when being transported on slave ships. As Valdez's silhouettes are nondescript they can assume many meanings. The transparency of the water allows for the layering of imagery and ideas, emblematic of the complexities of life and a meditation on what is means to be from the Caribbean. As Cuban historian Antonio Benítez Rojo wrote, "The culture of the Caribbean, at least in its most distinctive aspect, is not terrestrial but aquatic, a sinuous culture where time unfolds irregularly. The Caribbean is the natural and indispensable realm of marine currents, of waves, of folds and double folds, or fluidity and sinuosity." Water for a Caribbean artist who emigrated can symbolize at one time the insularity experienced living on an island and that which now separates him from his homeland.